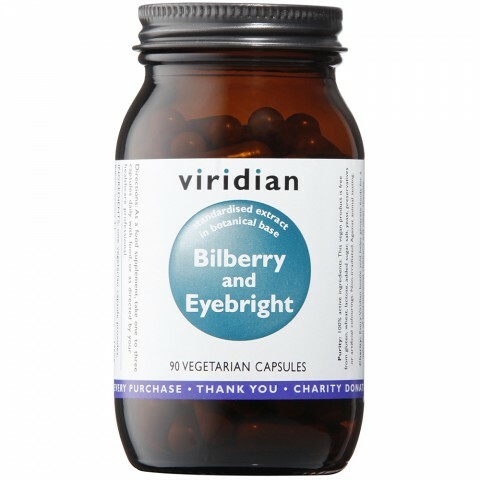 Combination of bilberry fruit, with bilberry extract together with eyebright. The standardised bilbery extract in this supplement is standadised to 25% anthocyanosides. Thought to improve blood flow and the delivery of oxygen to the eye. The potent antioxidant effects of Bilberry also protect the eyes from free-radical damage. Bilberry extract 4:1 175mg,¾Eyebright powder 100mg,¾Bilberry fruit powder 50mg,¾Standardised bilberry berry extract (25% anthocyanosides) 25mg,¾in a base of alfalfa, spirulina and bilberry.